Really pretty card, I like the spotlight coloring. I like your old stamp, I hadn’t seen it before! I think I know how you feel when you are stressed about one thing, it is hard to get anything else unrelated done. Glad you will be able to relax now! perfect for all three challenges, Cat - the spotlight coloring is perfect and the silver and gray are wonderful with the poinsettia! Love that stamp & your coloring, Cat! The grays were the perfect choice! gaspingly gorgeous, Cat!!!! OH be still my heart! Congrats on the Color Throwdown shout out! This is gorgeous, Cat! The highlighted poinsettia cluster with the silver background looks so classy! 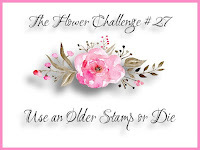 Thank you so much for playing along with us at The Flower Challenge!